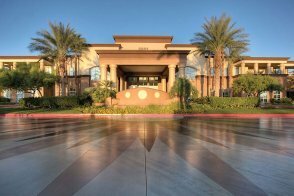 As its name suggests, this condo-style property is located on Las Vegas Boulevard (near Wigwam Avenue), which is only a few miles south of where the famous Las Vegas Strip begins. Shoppers -- especially bargain hunters -- will like this location because it's not far from the Las Vegas Premium Outlets - South. 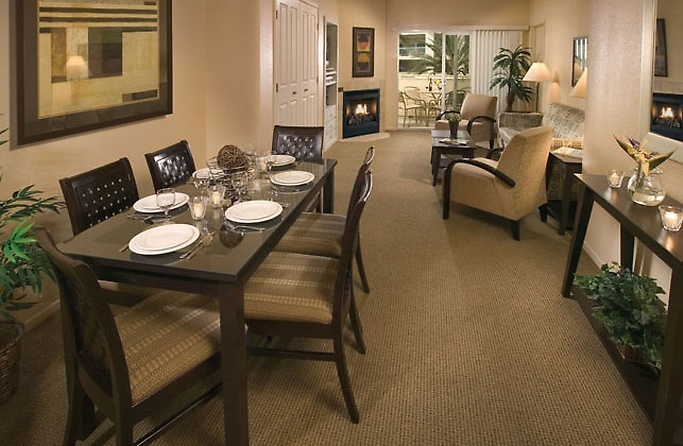 You can choose to stay in a one- or two-bedroom suite at the WorldMark Las Vegas Blvd. Each one has either a balcony or terrace and is equipped with a full kitchen, a washer/dryer set, a gas fireplace, a Murphy bed, multiple flat-screen TVs, a DVD player and a stereo. There are two swimming pools. Kids will love the lazy river while adults can relax in the hot tub. 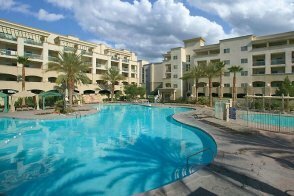 You'll also find barbecue grills, a children's play area, a shuffleboard court and a fitness center. For a little pampering, stop by the Serenity Spa for a massage, facial or "body ritual" (like the Anti-Stress Detoxifying Ritual). 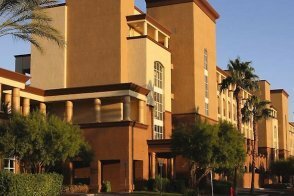 And if you don't have a car with you in Vegas, don't worry, because WorldMark Las Vegas Blvd provides free shuttle service to the Strip. No, but the property is only a couple of miles away from the Las Vegas Strip. Yes, there are two outdoor pools as well as a lazy river and a hot tub with a waterfall. Yes, there is a fitness center. Yes, there is a gift shop and the Las Vegas Premium Outlets - South and Town Square Las Vegas are in the vicinity. Yes, there are computers and a printer. No, but there is a small outdoor play area for kids. 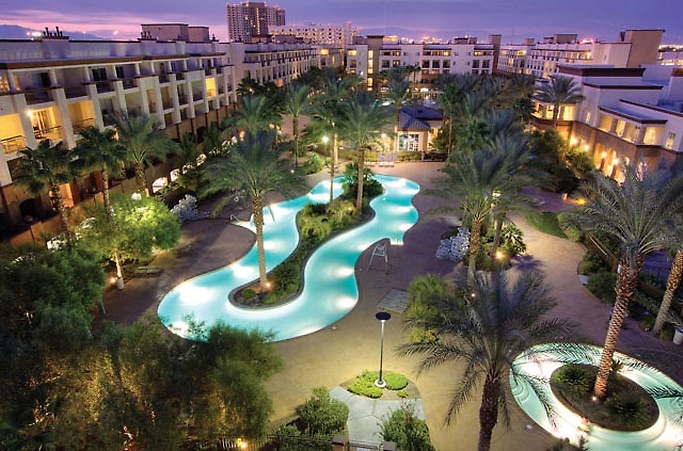 Luggage storage, 24-hour front desk and security and BBQ facilities. Yes, there is free shuttle service to the Strip. 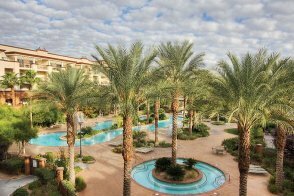 Resort fee WorldMark Las Vegas Blvd does not have any resort fees. This 850-square-foot condo-style suite comes with a king-sized bed in the bedroom and a queen-sized Murphy bed in the living room. 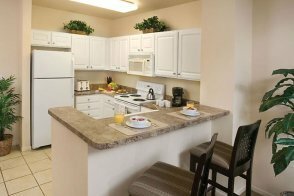 In addition to a fully equipped kitchen and a dining table with four chairs, amenities include a washer/dryer set, two flat-screen TVs, a DVD player and a stereo with a CD player. This 1,100-square-foot condo-style suite comes with two bedrooms. 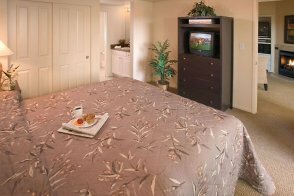 There's a king-sized bed in the master bedroom, either a queen-sized bed or two twin beds in the second bedroom, and a queen-sized Murphy bed in the living room. In addition to a fully equipped kitchen and a dining table with four chairs, amenities include a washer/dryer set, three flat-screen TVs, a DVD player and a stereo with a CD player. There are two bathrooms -- each may have a shower only, a tub only or a combined shower/tub.